After googling, you will notice that the Panasonic SD700 records 1920x1080 60fps AVCHD videos with advanced 3MOS sensor. The original format is .mts file with 1080/60p 28Mbps: MPEG-4 AVC/H.264. There are also AVCHD standard compliant recording in HA (17Mbps), HG (13Mbps), HX (9Mbps) and HE (5Mbps) modes with MPEG-4 AVC/H.264 video compression. And Aunsoft Video Converter for Mac is the recommended Mac Panasonic HDC-SD700 video converter to import HD videos to FCE 4 for editing. 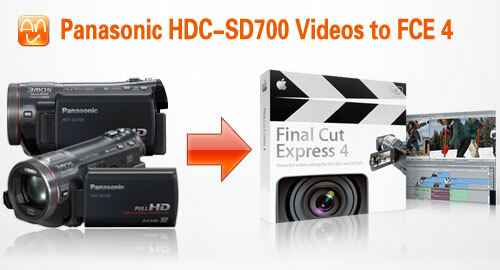 You may find the step-by-step guide below easy to make Panasonic HDC-SD700 HD videos compatible with Final Cut Express 4. Step 1. Load HS700 videos to Aunsoft Video Converter for Mac. Use card reader to copy and transfer .mts files from SD/SDHC/SDXC memory card to iMac hard drive disk, run Aunsoft Video Converter for Mac as the fast Panasonic SD700 to FCE 4 converter on Mac Snow Leopard, and click the "Add" button to load the 1080/60p .mts videos. You may also drag and drop the video footage to the application UI to add videos. Step 2. Choose MOV output format. Click the "Format" option, and choose Adobe Premiere/Sony Vegas > MOV (AVC)(*.mov) as output format. The Mac Panasonic video converter will convert SD700 1080/60p MTS videos to H.264 MOV for FCE 4. The output video will keep the original video resolution with high quality. Step 3. Convert Panasonic HS700 videos to MOV for FCE 4. Click the convert button on the bottom-right corner, and the Mac Panasonic video converter will start batch converting Panasonic SD700 1080p videos to MOV for Final Cut Express 4. Wait for a while until the conversion is finished, the HD .mov output files are compatible with Final Cut Express, and it is easy to edit recorded videos for movie making. The Mac Panasonic video converter also works with videos from other Panasonic cameras like Lumix DMC-Z57, HDC-TM700/HS700, HDC-SD60, HDC-TM350, DMC-ZS3, DMC-ZS7/TZ10, etc. You may get more information from the Panasonic camcorder column.